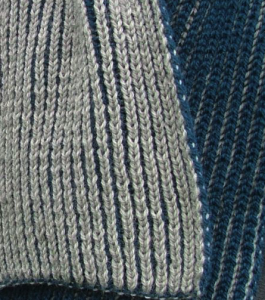 Or, how not to do two-color, brioche stitch in-the-round. Ask me how I know. 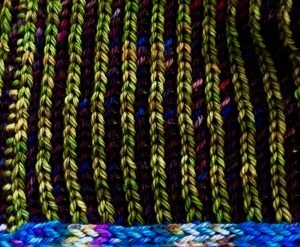 Most brioche stitch patterns create reversible fabric where the main color is more prominent on the front and the secondary color is more prominent on the reverse. So, in the photo, you see the light color shows up more on one side and the blue shows up on the other side. Even after reading knitting patterns for over 30 years, I can still make mistakes even when I think I’m following instructions. It’s even more amazing to me that the minor change I made makes such little difference on the front side of my knitted fabric and such a big change on the back. 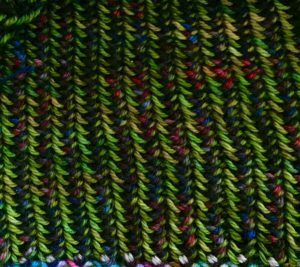 With two-color brioche knitting in-the-round, the simple instruction is to BRK (knit together the stitch with the yarn-over from the previous round), yarn-forward, sl1, YO. There are a few different ways of describing this simple repeat. I simply missed the yarn-forward part of this instruction. Here’s what the resulting front and back of my fabric look like. Two effects of this minor change to the stitch. First is that the fabric isn’t the same on both sides. Second, is that stitch gauge is quite different. My Briyoke will pull in less and be a flatter, wider fabric. I’m fine with both these differences. 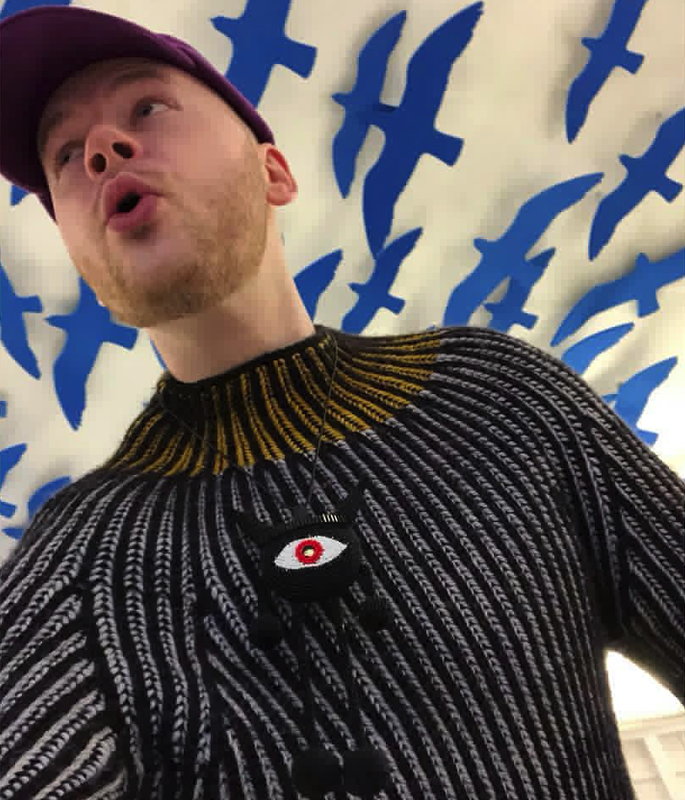 I didn’t expect to end up with a reversible sweater. I also think the wider fabric will look better and not show off parts of my body I’d prefer be a bit more hidden by clothing. All’s good, although it also took slightly more yarn than the original pattern called for. I finished the second West Coast Watch Cap from last blog entry and offered them to Thaddeus’ hairdresser. He liked both well enough that he bought them both. He wants to keep one in his house and one in his car. Thaddeus sold them faster than I was able to photograph the second one finished. I’m also almost finished with Briyoke. I only have about 16 more rounds of decreasing sleeve and a few ends to weave in. I should be modeling it for you in the next blog entry! Joe, this 30-year-veteran-teacher says that “A day is wasted if you don’t learn something.” Congratulations! 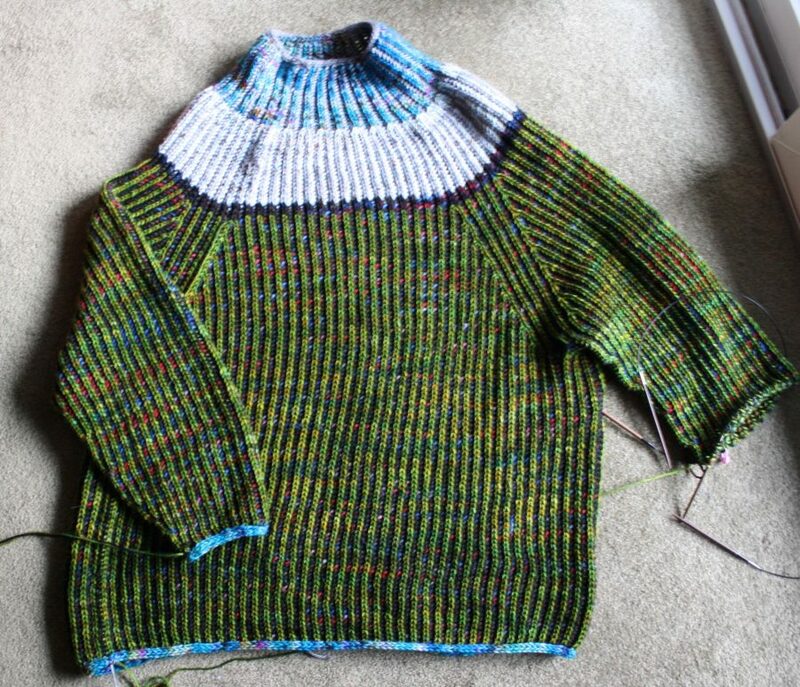 You have learned something and you are completing a perfectly lovely sweater! We should all have something so positive to report. Hope you have a great weekend.